Trump’s Envoy To Cameroon Holds First Meeting. By Eric Tataw – Sunday March 17, 2019. Tibor Nagy, US Assistant Secretary for African Affairs with his two hands semi raised in a meeting at the American Chamber of Commerce in Douala. Picture from American Embassy, Yaounde, Cameroon. A top American Diplomat who arrived the Central African country of Cameroon on Saturday March 16, 2019 has held a first meeting, National Telegraph has learned. 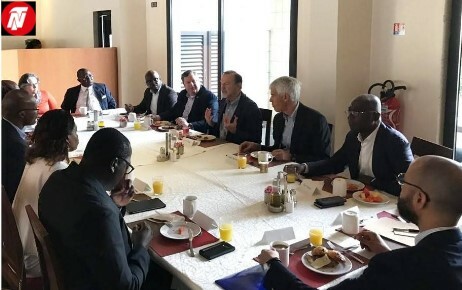 The Assistant Secretary for African Affairs, Tibor Nagy met with the American Chamber of Commerce in Douala to discuss how to increase trade and investment between the United States and Cameroon, the US Embassy in Cameroon has said. According to a statement posted on the Embassy’s official Facebook page, participants highlighted Cameroon’s immense economic potential and offered suggestions to improve the business climate. Peter Henry Barlerin, the U.S. Ambassador to the Republic of Cameroon was among the persons who attended the meeting in Douala, chief city of Cameroon’s Littoral Region, Sunday March 17, 2019, National Telegraph has confirmed. Tibor Nagy is also expected to meet Cameroonian authorities, Monday March 18, 2019 to discuss the political situation in the country and the armed conflict in the two English-speaking regions of the North West and South West Regions. Tibor Nagy had said Tuesday, March 12, 2019; “my heart breaks for Cameroon … I just don’t understand why this crisis goes on and on and on.”, he said while calling for “open, unlimited national dialogue.”, and suggesting “perhaps it’s time to take the deadly separatist crisis in Cameroon to an “international forum.”, he said referring to the North West and South West Regions. In the letter dated Monday, March 11, 2019, Eliot Lance Engel, U.S. Representative for New York’s 16th congressional district and Chairman of the US House of Representatives Committee on Foreign Affairs of the One Hundred and Sixteenth Congress addressed to Tibor Nagy, a US diplomat Eliot L. Engel, called on the State Department to address troubling crackdowns on freedom of expression in Cameroon. The United States just in February suspended its security assistance to Cameroon following credible allegations that the Cameroonian military carried out human rights violations in the two English-speaking regions. Nagy Tibor had made comments suggesting recommendations on the ongoing crisis but Cameroon’s Minister of Communication, René Emmanuel Sadi issued a bulletin warning the diplomat not to meddle into the country’s internal affairs. Previous Macron Administration Receives Key Letter On One Major Preoccupation In Cameroon. Next Cameroon Defense Minister Speaks In Buea, Begs Ambazonia Fighters, Betrays Communication Minister.